Although this isn’t likely to appeal to the average geek, it might appeal to the very girly female and especially to young females. 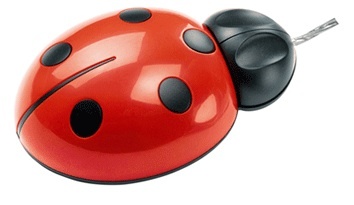 This cute ladybug works as a mouse and gives your computer a less boring look. After all, so often computer feature nothing but blacks and grays, which is fine, but it does get a touch monotonous. It also doesn’t have quite the cartoon-like look that the other ladybug mouse I’ve seen had. Since it’s not so cartoonish, it makes it a better prospect for women who enjoy anything with a ladybug theme. It’s a mouse, so the specs are pretty basic, it’s thankfully an optical mouse. I have on occasion come across a novelty mouse that wasn’t optical. It connects through your USB port and since it is just a mouse it will of course work with either a PC or a Mac. It’d be a great mouse to take to work if you can get away with it. Just to add a little more color to your office environment. The mouse is being sold through Lazy Bone UK and not at a bad price either. You can purchase it for $28.95.